Intuitive Life Movement (ILM)® is a way of moving and being that effortlessly brings you into alignment with your essential Self. It quiets your mind and awakens your body as you balance thinking with feeling, separateness with connection, and the finite with the Infinite. When you practice ILM you remember that you are more than your history, beliefs and identity. You heal and become more alive, centered and playful. You are at home in your body, more at ease and skillful in relationships and free to express yourself authentically. People at all levels of physical ability can learn ILM. The practice of ILM demonstrates that you have many more options and inner resources than you might ever have imagined. 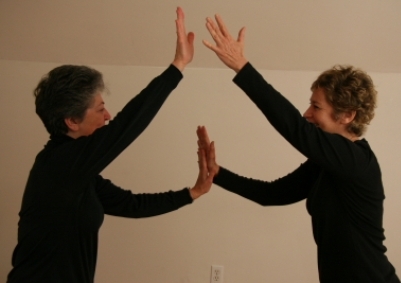 You begin by distinguishing and exploring six innate ways of moving and being. They are: habitual, consciously-directed, creative, free flow, intuitive and field- focused. The six ways open you to an expanded sense of self. Used together you have a remarkable set of tools to approach any situation. ILM has lots of benefits and is wonderfully freeing . But here’s the thing … it’s not for everybody. Practicing ILM can be every bit as confrontational as it can be genuinely liberating. Because ILM taps into your innate truth, it can reveal parts of you that you may be protecting or hiding, even from yourself. (Most of us want to be truly seen but are afraid of it at the same time!) Additionally, as you practice ILM in your life and relationships, in greater honesty and integrity with your essential Self, some relationship structures and beliefs will inevitably change. So, if you’re attached to maintaining a particular image, or committed to the status quo, ILM is not for you! are ready to risk change and co-create something new! One of the best ways to learn ILM is in the context of a group. Working individually and with others, you will find safety, support, stimulation and synergy rarely experienced in ordinary life. An intention of each group is to help bridge insights and new behaviors to your everyday world. Individual sessions offer a contained environment for in-depth exploration. You can schedule a single session or a package of 4 or more sessions that target your specific needs. • Explore 6 ways of moving your body and being in relationship with greater ease and authenticity. 1. Healing the Historical Body: Releasing chronic tension and body imprints of stored memories. 2. Relationships: Moving beyond habitual patterns into authentic Self-presence and intimacy. 3. Theme Work: Exploring personal and global issues, intentions and other growing edges. 5. Integration and Bridging: Bringing Intuitive Life Movement into everyday life. Call today for a free phone consultation to explore if ILM is for you.